My family went on a nature hike last weekend and I noticed that many of the oak trees are dropping their acorns. 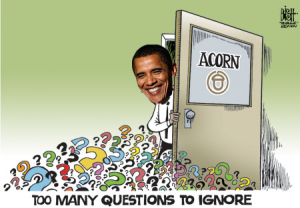 Happy Fall days are here for deer and squirrels, but not so great for ACORN (“Association of Community Organizations for Reform Now”). Although long ignored by the main stream (drive by) media, recent investigations by two journalists have finally blown the lid on the “alleged” corruption of this organization. Both Glen Beck and Bill O’Reilly have investigated and broadcast some of the unseemly tactics of this organization, but it took videos taped by James O’Keefe and Hannah Giles.